TS AGRICET Notification 2019 : Professor Jayashankar Telangana State Agricultural University (PJTSAU) invites applications from graduate holders in agriculture and seed technology to be admitted to a four-year B.Sc (Hons.) Agricultural study course by AGRICET 2019 . Candidates eligible for entitlement, Who are interested in check admission criteria and application form personally or by mail to the address below. Eligibility: A diploma in Agriculture / Seed Technology Diploma courses of PJTSAU / ANGRAU (Those who complete the academic year in 2019 -20 may also apply). Age limit: Candidates must have an age limit of 22 years for all candidates and 26 years with respect to S.C., S.T. And 28 years in relation to P.H candidates. I) Under the rules of the Government of Telangana. Ii) The above seats are allocated to 85% for local candidates and remaining 15% seats are treated as a full quota under the rules of PJTSAU. Candidates who are interested can apply for admission in the required pro forma together with a Demand Draft for Rs. 600 / - (only rupees of six hundred) for general candidates and Rs 300 / - (rupees three hundred) in the case of SC, ST & PH candidates in favor of Comptroller, PJTSAU, payable at Hyderabad. 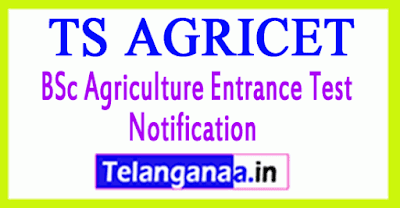 Application form filled in all respects with 2 self-addressed envelopes with Rs.5 / - stamp The convenor, reached AGRICET attached should - in 2018 , Department of Entomology, College of Agriculture, Rajendranagar, Hyderabad - 500 030, from 5:00 am or before Postal delays will not be tolerated. The potential candidates are Hall tickets will be sent to the address specified in the application. entitled The names of the candidates to write the entrance examination www.pjtsau.ac.in on along with the Hall-ticket numbers will be displayed in the website of the University. The candidates, the Hall tickets not obtained but can download display that page of the list of eligible candidates in the University website www.pjtsau.ac.in and appear for the entrance examination. for General and Rs.300 SC ST PH candidates - 2. Applications can also be up to filed with late fee Rs.600.